Samsung "Unpacked" event teases new Galaxy smartphones | What Hi-Fi? 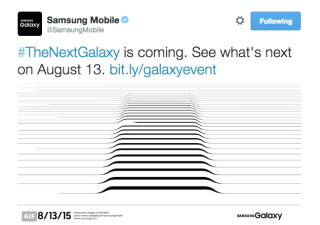 Samsung Mobile's Twitter account has announced an "Unpacked" launch event for Thursday 13th August, promising a look at "The Next Galaxy". This pretty much confirms rumours doing the rounds that the Korean giant is about to unveil a new Galaxy Note 5 flagship phablet and possibly even a new super-sized version of its curvy S6 Edge. The Galaxy Note 4 is one of our current favourites when it comes to smartphone video and audio quality, and initial reports suggest the fifth generation of the handset will offer a more premium finish, bringing it into line with the current S6 and S6 Edge. There are also rumoured to be changes to the phone's internal processor and the S Pen stylus, including a tweak to the way it's housed in the handset. It's also likely that Samsung will use this event as an opportunity to take the wraps of a larger version of the S6 Edge+. The current model has a 5.1in Super AMOLED screen, but the '+' looks set to get more real estate and a bump up to 5.5inches. Samsung will be streaming the event live on its website on the 13th, starting at 11am EDT - 4pm in the UK.